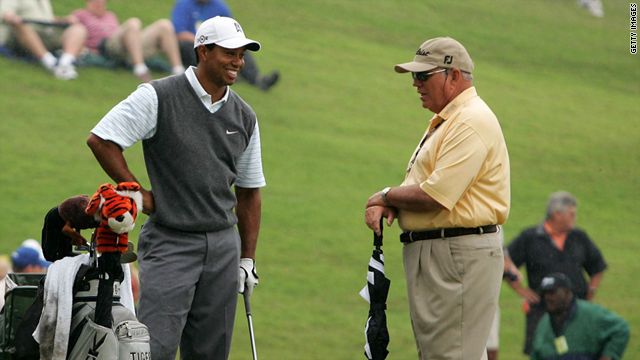 Butch Harmon is concerned about Tiger Woods' career as injury forces the former world No. 1 out of the Players Championship. (CNN) -- Tiger Woods' former coach Butch Harmon has revealed his fears for the former world No. 1's future, after injury forced the American out of the opening round of the Players Championship at Sawgrass on Thursday. Harmon believes a huge question mark now looms over Woods' career after the 14-time major winner forfeited his round after playing just nine holes in a six-over-par total of 42, which included a triple-bogey at the par-four fourth. "I think his whole future is up in the air," Harmon told reporters. "Does it mean he needs more surgery? If he does who knows what is going to happen." Speaking to reporters after pulling out, Woods added: "I felt good this morning and fine during warm-up and then as I played, it got progressively worse. The knee acted up then the Achilles followed after that, then the calf started cramping up." The 35-year-old's career has been marred by four knee operations and the Players Championship was his first tournament since injuring his knee and Achilles heel during a difficult stroke on the 14th in the third round of The Masters in April. Woods was then forced to withdraw from the Wells Fargo Championship earlier in May and his latest injury has compounded worries for his career, which has not seen a victory in 18 months and a major title win in three years. Woods' withdrawal mirrors his showing at last year's Players Championship, where a neck injury brought an end to his bid on the seventh hole in the final round. He now has just over a month to get fit enough for the U.S. Open, but medical experts are doubtful that he will be able to recuperate in time for the required practice rounds ahead of the championship tournament at Bethesda on June 16-19. Meanwhile, England's Chris Wood mastered tricky conditions to open up a three-shot lead at the halfway stage of the Iberdrola Open in Majorca on Friday. The 23-year-old carded a five-under-par 65 to move to eight-under-par after 36 holes -- ahead of compatriot Matthew Nixon and Northern Irishman Darren Clarke, who both hit level 70s. Wood is eyeing his maiden European Tour victory after losing a playoff to British Open champion Louis Oosthuizen at the Africa Open in East London in January. Overnight leader Gregory Bourdy of France, who set a course record 63 on Thursday, slumped to a seven-over-par 77 to leave him on level par 140.